Fantique presents its clients with its brand-new, rich internet website. 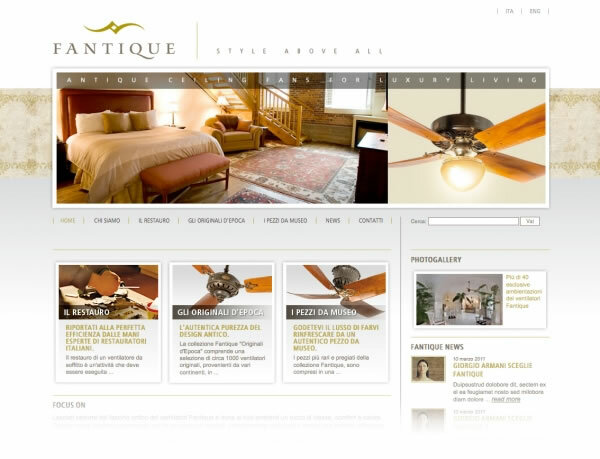 The most beautiful ceiling fans belonging to the “Antique Original Pieces” and “Museum Pieces” collections, are shown. In the dedicated sections, you will find a large selection of antique original pieces, perfectly restored to their original splendor by the skillful hands of Fantique craftsmen. The product file of each fan informs you about its specific origin and technical characteristics and a pdf. summary file may be downloaded. Within the website is displayed a vast photo gallery with more than 40 different settings, showing the extent to which our gorgeous “air agitators” are able to enrich any type of surroundings and furnishing. Also: news, product information and in-depth reports, as well as a large corporate section introducing Fantique, illustrating its market approach.